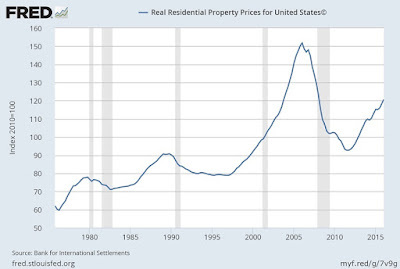 US housing prices have recovered so that they are more-or-less back to the long-run trend that existed before the price bubble of the early 2000s. 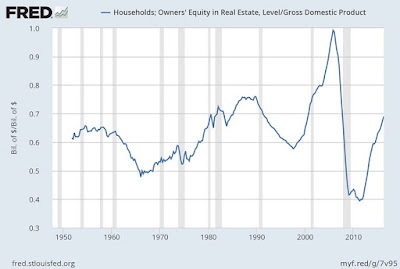 The total amount of equity that US households have in the form of housing has largely recovered too. Here, with the help of the FRED website run by the Federal Reserve Bank of St. Louis, is a quick overview of the recent roller coaster ride for US housing markets--which leads to the case for why state and local government should be tweaking their priorities to encourage more homebuilding. Here's the bounceback in housing prices since about 2012. There are rises and falls over time, but the current value isn't too far from the trend over the last four decades. 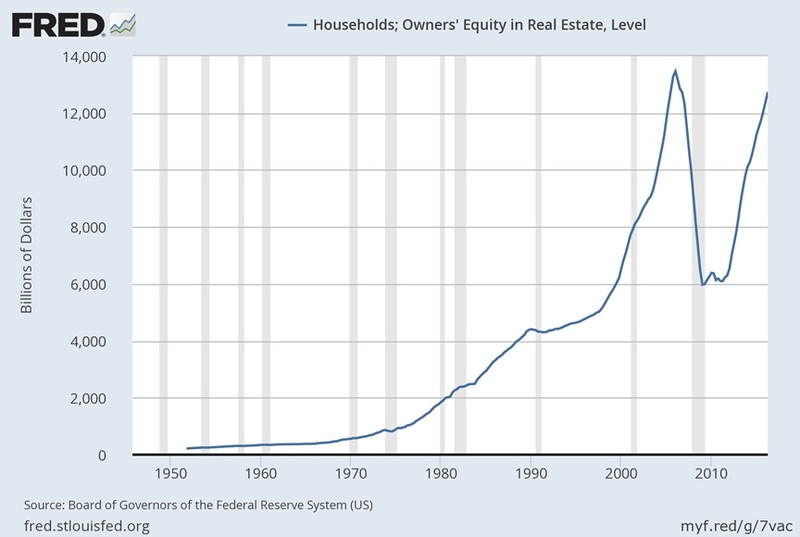 The amount of equity that homeowners have in real estate peaked at about $13 trillion at the top of the housing bubble in 2006, then dropped by $7 trillion by 2009 (! ), and since 2012 has rebounded back up to almost $13 trillion again. Another perspective is to look at homeowners' equity in housing divided by GDP, which adjusts for changes in inflation and in the size of the real economy over time. With this adjutment, you can see that homeowner equity was mostly in the range of 50-70% of GDP for the second half the 20th century. The housing bubble pushed homeowner equity up to nearly 100% of GDP in 2006, and the bursting of the bubble dropped it to 40% 2009. 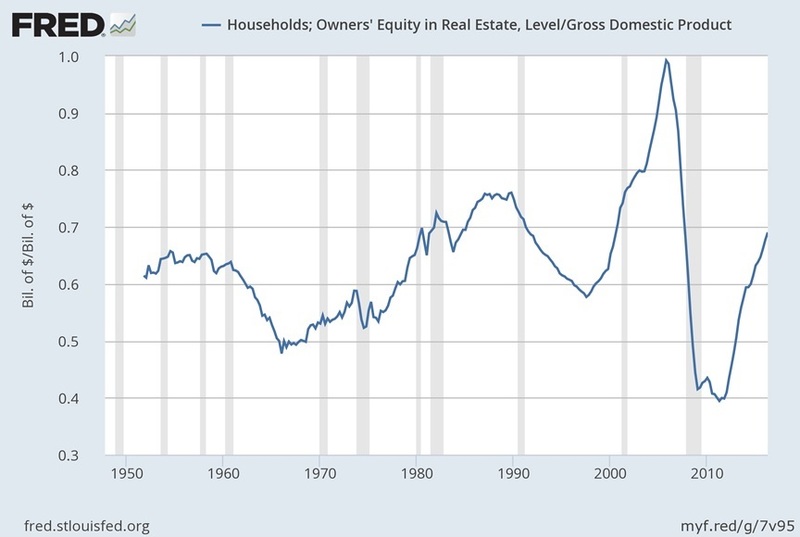 Yet another way to slice this data on homeowner's equity is to look at it relative to the total value of the real estate. 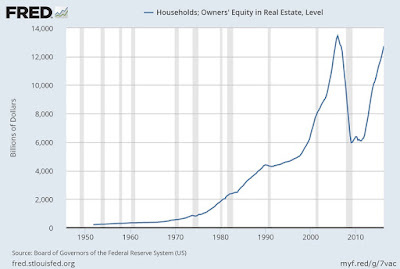 For example, though the 1970s and into the early 1980s, it was common that about 70% of the total value of real estate was equity for homeowners--while the rest was presumably mortgage debt owed to lenders. 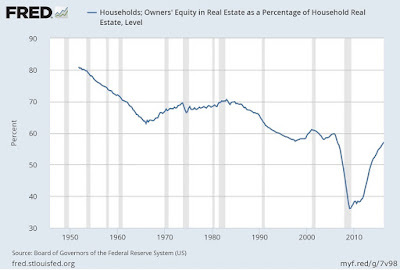 But even with the rise in housing prices in the 1990s and early 2000s, the share of that value which was homeowner equity was falling, as homebuyers borrowed more aggressively. when the housing bubble burst and the value of homes dropped, the size of the accumulated borrowing remained. The share of housing value that was home equity dropped almost to 35%, which would have been half the level prevailing back in the 1970s and early 1980s. 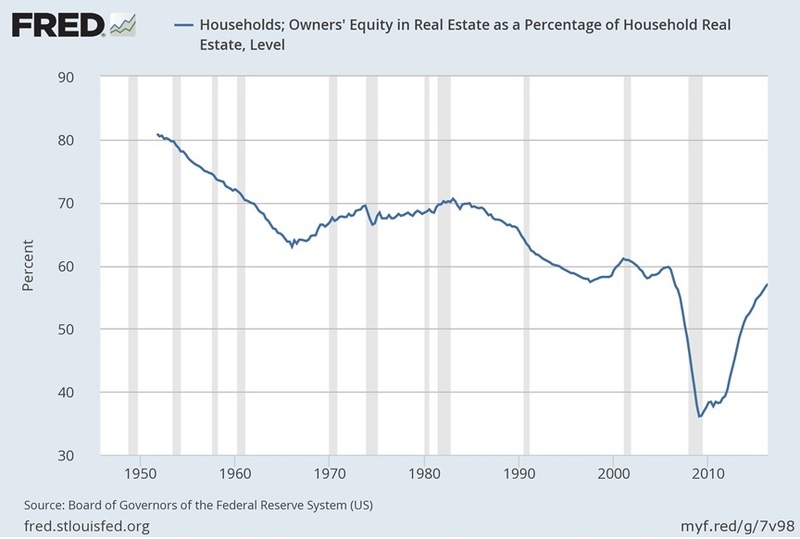 The share of real estate that is homeowner equity has now bounced back, but is still under 60%. The movements in housign prices also affect home construction. 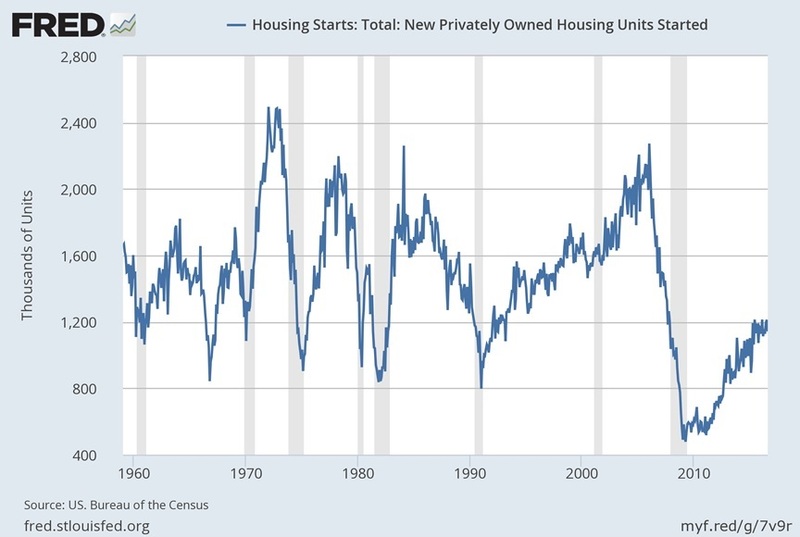 Here's the pattern of new housing starts since the late 1950s. These figures are measured in units of housing starts--that is, not relative to the size of the US population, which was about 180 million back in 1960 compared with 320 million today. 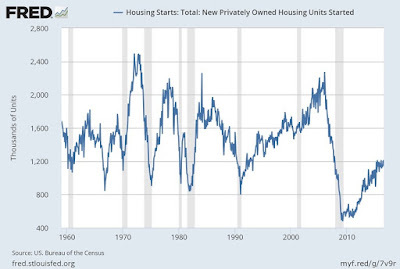 The data on housing starts is spiky, but the long run-up for the construction industry from about 1990-2005 is clear enough, as is the dramatic fall in construction after that to the lowest levels seen in this data. . There's been a bounceback, but in historical context (and given the larger US population and smaller family sizes), it seems rather modest. 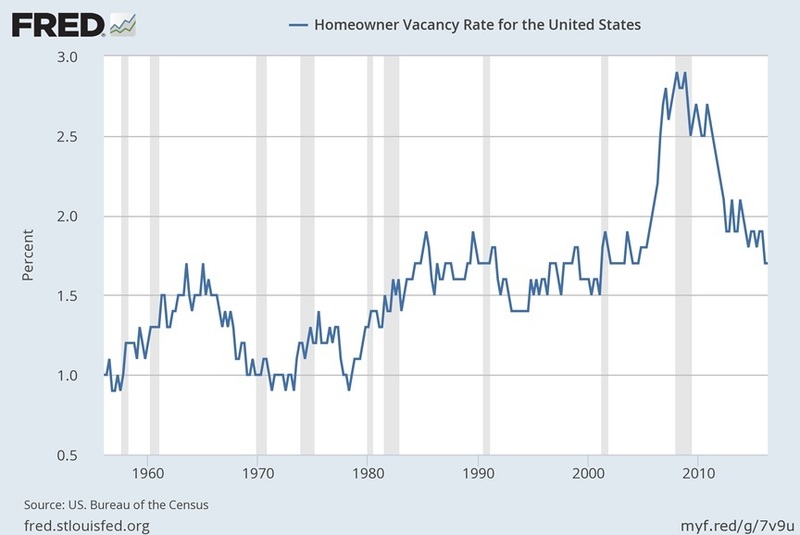 The "vacancy rate," or the share of share of homes that are vacant, is one more measure of the current state of the housing market. 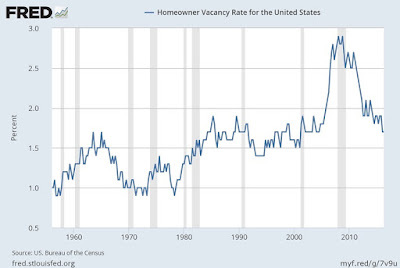 The vacancy rate peaked during the housing bust, but is now back down near levels that commonly prevailed during the 1980s and 1990s. 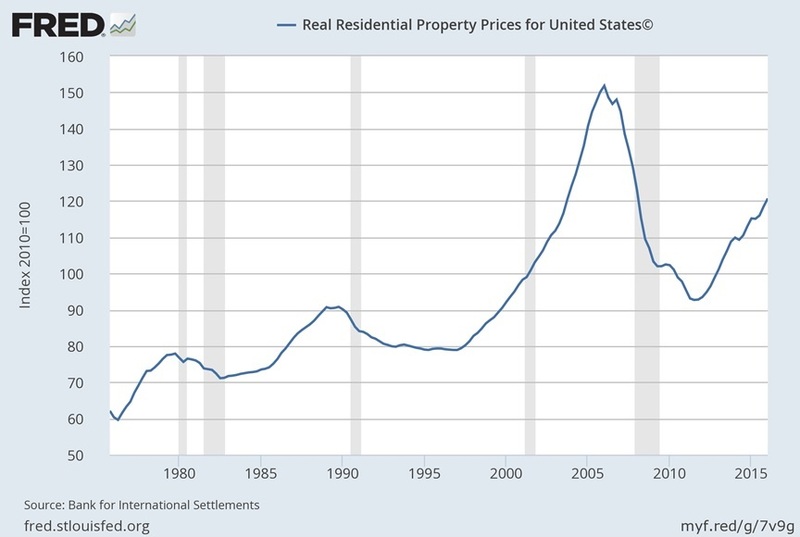 The recent bounce-back in housing prices seems to me different from the rise during the bubble. During the housing bubble in the early 2000s, there was a large amount of building (as shown by housing starts), which was sitting vacant (as shown by the vacancy rate), and financed by borrowed money (as shown by the low level of homeowners' equity relative to real estate values at a time when prices were rising). The recent bounce-back in housing prices is happening at a time when construction levels remain relatively low, vacancy rates are at historically common levels, the total value of housing relative to GDP is at historically common levels. Thus, my sense is that the bounce-back in housing prices isn't about a borrowing-driven boom in demand, but is more about limitations on housing supply. Those limitations are not typically a matter of federal policy, but are imposed by state and local governments, and by neighborhood activists and courts, whose efforts have the effect of discouraging construction and keeping housing prices higher than they would otherwise be. Jason Furman, the head of President Obama's Council of Economic Advisers since 2013, has forthrightly made this point. Last November, for example, he gave a talk called "Barriers to Shared Growth: The Case of Land Use Regulation and Economic RentsRemarks," where he said: "I will focus on how excessive or unnecessary land use or zoning regulations have consequences that go beyond the housing market to impede mobility and thus contribute to rising inequality and declining productivity growth." "In addition to housing affordability, these regulations have a range of impacts on the economy, more broadly. Reduced housing affordability—whether as an ancillary result of regulation or by design—prevents individuals from moving to high productivity areas. ... Ensuring that zoning and other constraints do not prevent housing supply from growing in high productivity areas will be an important objective of Federal as well as State and local policymakers."